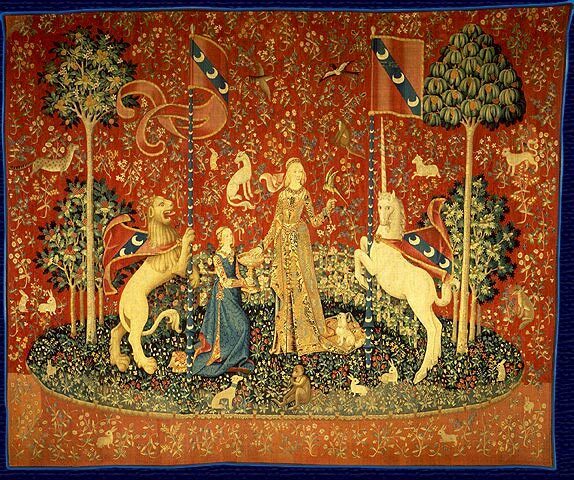 Six individual tapestries make up the “Lady and the Unicorn” or “La Dame à la licorne” series. Considered to be one of the greatest works of art of the Middle Ages, the tapestries are on display at the Musée National du Moyen Âge in Paris, France (formerly known as the Musée de Cluny). The museum itself is one of the oldest buildings in Paris, having been a former townhouse that dates back to 1334. Its foundations, however, are even older, as they stand on the ruins of a Gallo-Roman bath, which is believed to date from the 3rd century. The museum houses a wide array of extraordinary medieval artifacts, including stained glass, furniture, sculptures and manuscripts. But its best-known items are the tapestries. They were created in Flanders, known for its exceptional weaving work, sometime around 1500, and were likely designed by a man known as the Master of Anne of Brittany, a well-known artist at that time. They were probably commissioned either by Jean le Viste, a very prominent noble in the court of the French king, Charles VII (1422-1461), or Antoine II le Viste, who was also an important noble figure and a descendant of the same family. The tapestries would have cost a fortune to produce, and only the wealthiest members of the nobility could afford to commission such intricate and detailed pieces. The tapestries did not come into public prominence until they were discovered by Prosper Mérimée, a French writer, in 1841 at Boussac castle. Unfortunately, the tapestries had not endured the passage of time well, and showed evidence of having been gnawed at by rats, and were going mouldy. 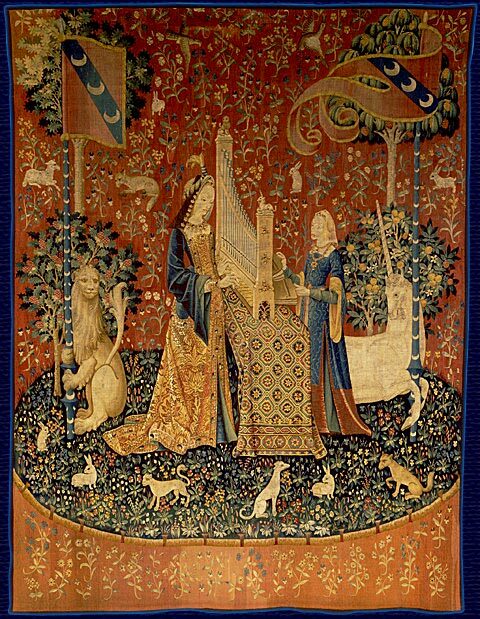 The Lady and the Unicorn (French: La Dame à la licorne) also called the Tapestry Cycle is the title of a series of six Flemish tapestries depicting the senses. They are estimated to have been woven in the late 15th century in the style of mille-fleurs. 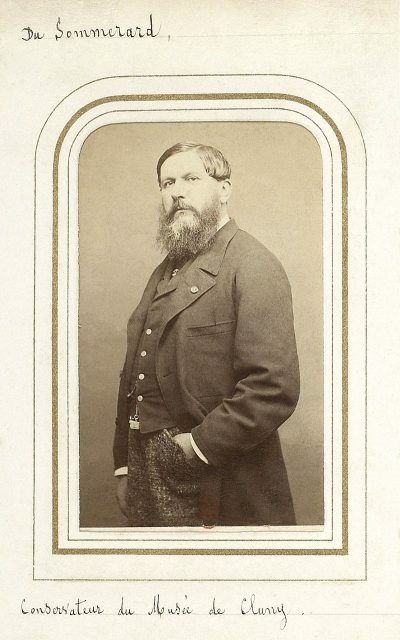 In 1882, they were rescued by the museum in which they are now housed, costing the enormous sum of 25,500 francs, and brought to Paris to undergo conservation and restoration. Woven in a “millefleurs” or “thousand flowers” style, the tapestries depict the 5 senses: taste, touch, sight, sound, and smell, with the sixth depicting “à mon seul désir,” literally “my only desire” although it has also been translated as “by my will alone,” “love desires only beauty,” and “according to my desire alone” which has been interpreted as a declaration of independence or even purity. Each of the hangings features a noblewoman, dubbed the Mona Lisa of the Middle Ages. With her is a unicorn – hence the name of the pieces – and a lion. Some images also include other animals, like a monkey, rabbits, dogs and birds. 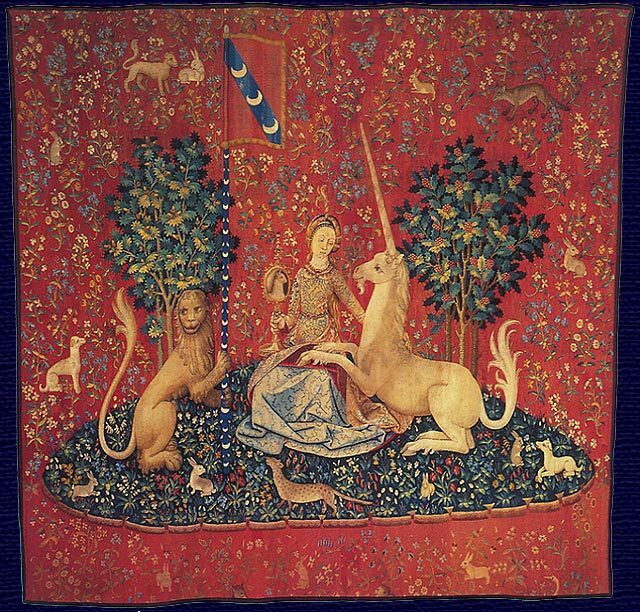 In “Touch”, the woman is featured touching the unicorn’s long horn, while holding a heraldic pennant, while a lion sits placidly to her right. The Lady and the unicorn Touch. In “Sound”, she plays an instrument called a portative organ, which sits on a table covered with a richly embroidered rug, her maid operating the bellows. 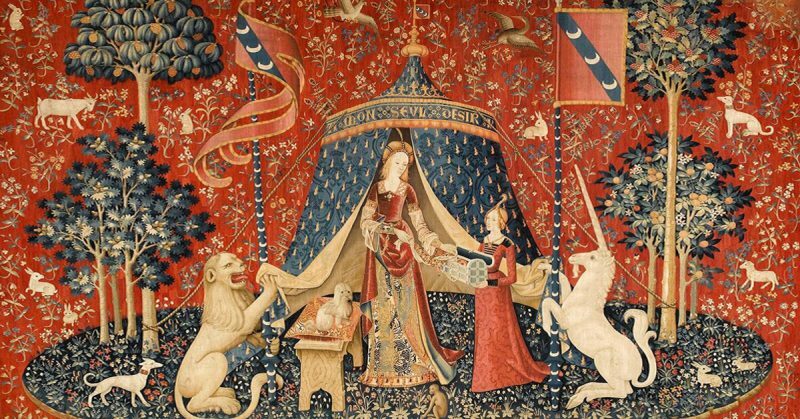 The unicorn and lion both hold pennants on either side of the woman. “Smell” features a second woman, as does “Sound”, holding a basket of flowers as the noblewoman weaves a wreath. The lion and unicorn are again on either side of her with their pennants, and a mischievous monkey can be seen, having stolen one of the flowers. In “Sight”, the woman, now seated, holds a mirror, while the unicorn, whose front legs are in her lap, looks at his own reflection, brilliantly shown in miniature on the piece. The lion, again to her right, holds the pennant. In “Taste”, the noblewoman takes something from a dish, held by her maid, while looking at a parakeet in her hand. In this tapestry, both lion and unicorn are rearing, and the monkey is at her feet, eating something, likely from the same dish. 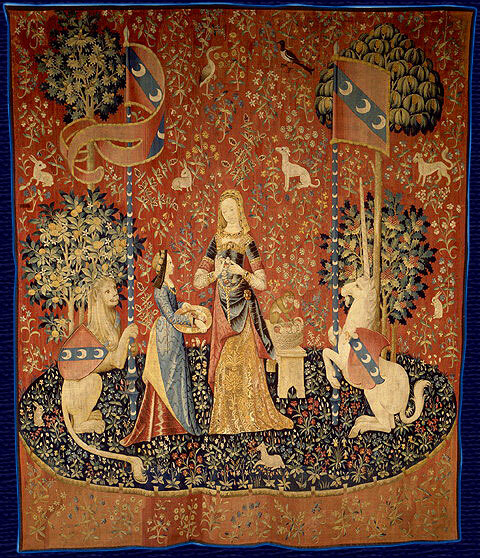 The sixth tapestry is the largest of the series, and, in addition to standing in a patch of flowers or a garden, the woman stands in front of a tent across which is written “À Mon Seul Désir,” hence the title given to this piece. The woman is seen placing a necklace that she wears in the other tapestries into a box, held by her maid – or perhaps she is taking it out of the box; we do not know for certain. Interestingly, this is the only piece in which she is smiling. The Lady and the unicorn Hearing. This tapestry may represent the sixth sense, or understanding – a theory put forth based on the sermons of French scholar Jean Gerson, whose work would probably have been familiar to the designer of these tapestries. However, other interpretations suggest that the images in this tapestry represent virginity or simply love. 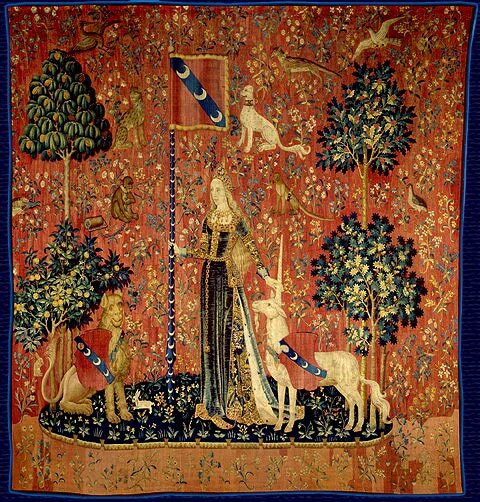 Regardless of the various interpretations put forth over the years, these tapestries remain an incredible example of Flemish weaving and workmanship and provide a charming look into the aesthetics and symbolism of the Middle Ages, in particular, the importance of the unicorn in Medieval imagery. They have featured prominently in popular culture, including a book by art historian turned novelist Tracy Chevalier, fittingly called The Lady and the Unicorn, and even in the Gryffindor common room in the Harry Potter movies. 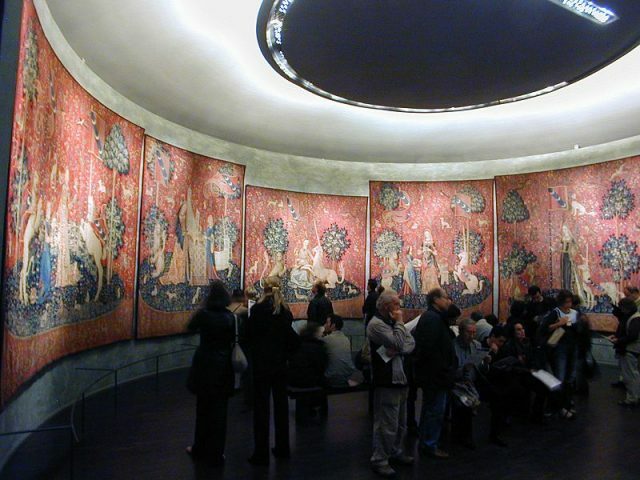 The tapestries were recently on loan to the Art Gallery of New South Wales in Sydney, but have since returned to their permanent home in Paris.